When I posted last week’s 1910s Rate the Dress I knew that the colour scheme wasn’t likely to be popular (personally, I’m sure you know I adore neutrals, and I thought the plum-y contrast of the collar was an inspired choice), but I forgot about your hate of the top-heavy, blouson 1910s silhouette. For this week’s rate the dress, we’re going allegorical. Our subject, possibly Jeanne de Marigny, is shown in a mid 17th century allegorical portrait, possibly as ‘Fortune’ or ‘Vanity,’ literally dripping in wealth. She has a pearl circlet on her head, pearls around her neck, garlands of pearls festooning her neckline, with further strands of jewels and pearls across her chests. She carelessly lets more precious gems and gold coins drip from her fingers, and gathers them up in her skirt as if they were no more than flowers. While the painting is an allegory, and her dress may be a fantasy, it adheres to the fashionable styles of the mid-17th century, with the boned, fitted bodice that would become the base of the robe de cour, a sweep of pleated skirts in lush fabric, and a filmy neckerchief covering the excess of skin revealed by the extremely low neckline. The picked-up skirt allows the wearer to show that it is not only made from expensive silk, but lined in the same, and worn over a petticoat of even more expensive brocaded silk – a decadent luxury that would fit in well with either ‘Fortune’ or ‘Vanity’. What do you think of our lady? Was her outfit a fortunate choice, or will your verdict prick her vanity? Oh wow–oh wow oh wow oh wow. I have a soft spot for blue and gold, and think that the color combination makes for something marvelous. I love it. I love it, I love it, I love it, I love it. My favorite so far! Although this whole thing feels rather vain to me, it is a lovely painting. I love the bodice of the dress, and the jewels and pearls that adorn it. I am less fond of the skirt; I feel like the colours are very bright, especially against the more toned down shades of the bodice. The brocade shawl that goes over her far arm and you can see running behind her back seem rather sudden to me, as does the white part of the sleeve closest to us. We are all creatures of our time. I love the vivid peacock blue, and the bold orange, of her gown, but together, to me, they spell “HoJo’s” (short for Howard Johnson’s, an obsolete American fast-food chain of the 1970s and early 1980s that used a similar blue and orange in its logo and restaurant buildings). The heavily metaled bodice, meant to convey extreme wealth, looks vulgar to me–probably because my tastes have been molded by our times. However, I love the mid-17th century silhouette, the hair style and hair jewelry, and the use of pearls (even the multiple swags of them). And I also love the texture and sheen of the silk, whatever I think of its colors. So overall I’ll go with a 7. By the way, my monitor showed the collar and contrasting trim of last week’s outfit as chocolate brown, not plum. If I’d realized they were plum, I probably wouldn ‘t have liked the outfit as much. I love this dress. I could do without some of the bling, but the colors, the shape, the fabrics. It’s getting my costuming fingers twitching! I’ll give it a 9 out of 10! Kingfisher colours! Not what I would chose, but my, they are effective! I love the triple stranded pearls swagged around the neckline. (Though is seems a bit far south to be called a neckline! Thank goodness for drapey muslin.) I’d love to see more of the patterned orange/brown she has draped over her right arm – looks lovely. Minus one for being an allegory, and for those daft wee curls around her forehead – which have nothing to do with the dress. Kingfisher! I was thinking peacock, but it didn’t feel quite right. Kingfisher it is! Now my other monitor shows what I saw as orange on the other as a rich bronze-gold, and I like it even more, so definitely a 9. I don’t know why I like this era’s gowns so much… the improbable grace of them, maybe. The bodice is cuirass-stiff and too low for modesty, yet the women in the dresses look like they could run or walk or dance with ease. The front is stiff, but the waist isn’t squished. There’s a girlishness to the look, which is appealing. It’s nice to see the hair down. As for this dress in particular, I like the brocade underskirt, a luxurious surprise. Like “Oh, this gorgeous, expensive thing? I use it as underwear to support my plain satin skirt!” Same goes for the gossamer fabric at neck and inner sleeve. And the quiet luster of pearls makes her skin glow. Everything about the dress is touchable. I think it would feel wonderful to wear: the fabric and pearls at first cool on the skin, but gradually warming up to body temperature. Everywhere smoothness and beauty, and the rustling whisper of silk with movement. As for downsides, first, if I did wear it, I’d be a bit shy, and probably cold up top! And second, I’d worry about the metallic trim on the bodice catching the sleeve and pulling threads out of it. I could care less for the jewels she so negligently drops, they seem like the painter/sitter trying too hard to make the allegory. I rate the dress as 8 out of 10. I would like it better if the bodice were less trimmed. 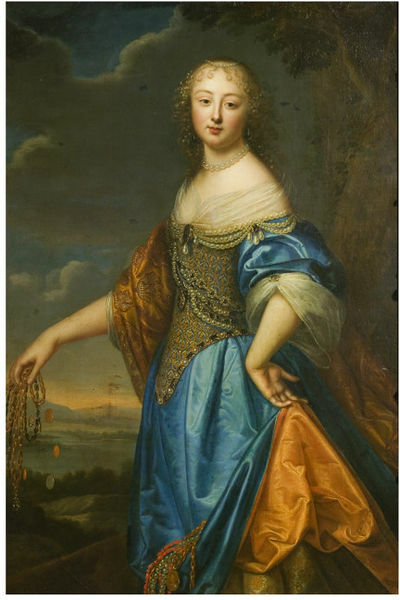 Usually I love 1650s/60s dresses, but there’s something about this painting that is offputting. The gown seems TOO bright and showy (perhaps that’s the point – she’s demonstrating her wealth in the most obvious way). It is, as you say, allegorical, but not (I think) tasteful or elegant. Oh dear. I’ll give it points though for the sitter’s delightful face and ringlets. When it comes to allegorical portraits, I can usually take them or leave them. I prefer the more genuine, although still admittedly manipulated, style of portraiture from that era. The load of jewels cradled in her uplifted skirt is more than enough to make the point, especially when added to the mass of pearls she’s already sporting on the gown. The addition of “wealth” dripping from her hand is just too much and, for me, both redundant and visually distracting. I especially dislike the use of contrast that makes her shoulders and head so prominent while, at the same time, making her hair blend with the background to the extent that it seems to disappear. But that’s not directly related to the dress, so here goes. I like the use of color – rich and excellent contrast. The “Oh, this little thing?” flash of decadent petticoat is great. I don’t like the neckline, but I love the pearl swag that falls from it – especially those triplet drops of huge baroque pearls – and visually pulls the neckline even lower. The bodice embroidery is completely over the top and I love it. If it had been done as a regular portrait with just the dress and the wearer presented with better lighting and no allegory-induced “message” I’d like it much better than I do as it’s presented here and would have given it at least a 9/10. But the background is too muddled and detracts from the subject – she looks bald, for heaven’s sake – and the added stuff used to communicate the allegory really ruins it for me. However, it’s still a good dress. This is a tough one. I’m going with 7/10…saved by the dress, not the artist. Well I have to admit that for me this is just another interchangeable mid 17th century dress worn by another interchangeable mid 17th century noble woman. Her name might be Marie-Therese or Marie- Louise or Louise-Marie or so….like she’s one of those. Yet looking at it again I noticed that this corset with these jewels would really work as an armor for her. You can shoot or stab her from the front or the back: she’ll remain unharmed. Really she could go into battle like this. Another glamourous but more grim association are the daughters of the last Russian tsar who lasted by far the longest during the killing of their family in 1917. That’s because the imperial princesses had sewn their jewellery into their corsets so they could not be taken away from them by the revolutionaries. Well unfortunately it did not save them after all, but it proofs: a corset+plenty of sewn in jewellery= excellent protection nevertheless. With that in mind I give it a 9.5. Criminy! You’d need a “boned fitted bodice” to support that kind of weight without the “neckline” moving even closer to being a waistline! I love the broad sweep of bold colour, with the added detail of the bodice, petticoat and ?shawl to prevent it being blocky & boring. The gauziness at shoulder and sleeve seems to detract from the overall power of it, though that might just be personal taste. Ditto her hair – her head seems a bit of an afterthought to the outfit, which isn’t an effect I’d go for myself. 7.5/10 – if she’s aiming for the visible personification of luxurious wealth, I’d say she’s about hit it. I love the colours, I’m so partial to blue on orange/dark gold. That being said it’s not my favorite era, and the brocade of the bodice doesn’t really make me excited. Then there are the pearls though, and I love pearls. All in all it’s one of my favorite dressed in RTD of this time period, so I’m happy to give it a 9 just for the choice of colour and fabric in the skirts. Yep, it’s a 9/10 from me. And pearls are a girl’s best friend, diamonds are just for show. 5/10. Just can’t summon up any enthusiasm for this one, sorry. The colours are undeniably beautiful but it’s all a bit “haven’t I seen this all a hundred times before in different colours and fabrics?” Ultimately, it’s stunning but a gorgeous, sumptuous, big fat yawn. And at least it’s not a horse-faced later 17th century Aristocratic Beauty with major neck crick holding a sixe XXXXXXXXXL taffeta parachute around her with one hand. When I was teaching myself dress history I thought that was how ladies dressed between 1680 and 1720 and since then I have an enduring dislike of those portraits for being so misleading….